Founded in 1999, Maintenance Connection helps clients by developing, implementing and servicing CMMS software. The team at Maintenance Connection is customer-focused and technology driven. With solutions crafted around every aspect of work order management, their software continues to impress clients year after year. The company hires staff that values response time, customer service and technical know-how above all else. That’s how Maintenance Connection has retained its role as a formidable CMMS software provider. Maintenance Connection’s work order management software starts with the facility and ends with the technician, encompassing every aspect of the process in between. Use the CMMS software to automate work order processing, to track open orders and to assign new tasks. When users log in, the first thing they see is the Workcenter. Designed to keep each user’s roles at the forefront of their experience, the maintenance management software color-codes the most important utilities for each user’s specific role in the company. Need to find urgent work orders? The dashboard keeps the most important choices in red until they are resolved. This also functions as effective asset management software. Maintenance Connection was invaluable for the Penn Yan Central School District. With over $20 million in upcoming renovations, they needed a CMMS package that would help protect the publics’ investment in their construction efforts. With Maintenance Connection, all assets, from classroom computers to their transportation fleet, can easily be monitered, managed and serviced. Keep track of everything within an organization with an easy-to-use interface that keeps equipment organized. Pull pivot tables, run reports and stay in touch with coworkers. 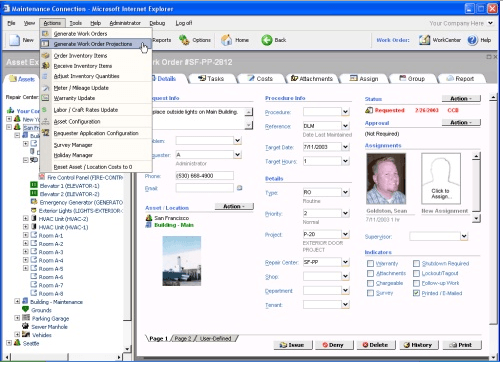 This CMMS/EAM software is a powerful addition to any organization with a maintenance staff. Learn everything you need to know about Maintenance Connection. Our experts will reach out to you shortly.